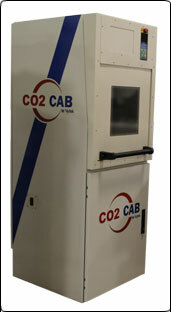 CO2Cab X3 - G & W Machinery Sales, Inc. The NEW Vytek 3X systems are a revolutionary way to approach large area laser marking and cutting. With traditional Galvo systems both field size and spot are linked. If you want a larger field you had to compromise on spot size. With typical 2 axis systems large area marking requires either a moving galvo assembly or multiple laser/galvo units. The 3X is the perfect balance for large area cutting and marking. With the 3X series, extremely large field sizes and small spot sizes are achieved with Vytek's exclusive high speed moving beam expander. The spot size is dynamically managed as the galvo moves over the marking or cutting area to compensate for the change in spot size. Vytek is the first and only laser company with a standard lineup of 3 axis galvo systems integrated into a stand alone format. Vytek has designed an all inclusive steel structure to house this amazing technology that reduces the effects of the surrounding vibrations while offering a thermally stable support structure. The Galvo is fixed mounted at the top of the structure and the system integrates an oversized moving Z table to present the work to the Galvo assembly. The table assembly is ready to accept a customer supplied fixture assemblies or one of a several table options available. Field sizes offered in the 3X series can be up to 36" in the standard enclosure and over 72" in our OEM modules or custom enclosures.